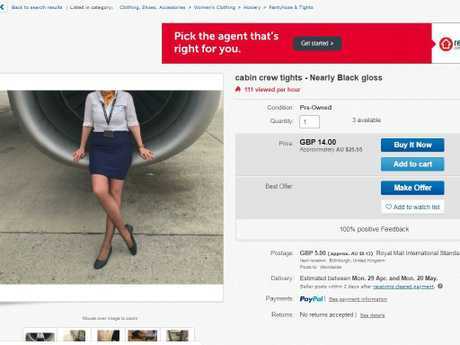 Air stewardesses are said to be selling their used tights and unwashed uniforms to perverts on eBay in a bid to make ends meet, it has been claimed. 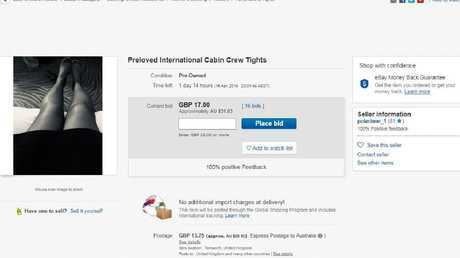 Cabin crew from a range of top airlines have been offered as much as £500 (AU$910) for a pair of tights they described as "well-worn". Items listed online include name-badges and even shoes filled with the "fragrance of my natural perfumes". 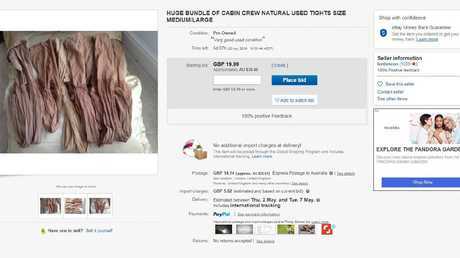 One listing for a pair of used tights says: "Worn on many long distance journeys on very long hot shifts." Its description adds: "Very worn and fragrant of my natural perfume as often worn minus underwear." A male Norwegian Airline steward said one of his colleagues was offered £300 (AU$545) for a photo of her wearing the outfit being sold. A man who has worked for Norwegian Airlines since 2015 said his colleagues on "every flight" are taking part in the antics. "You do think, 'oh goodness £500, it's a lot'," he said. "People think we have a glamorous life going around the world. I don't think people realise we are reduced to selling our used crew shoes to make ends meet." 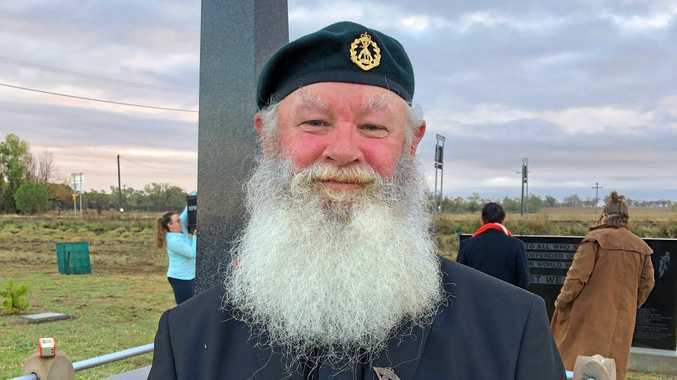 The staff member later added: "An awful lot of crew I am flying with have been reduced to selling uniforms. "On every flight, at least one or two are doing it." Although he blasted the "perverse market" as awful, he is thinking of copying his colleagues as he is struggling to live on minimum wage. "Norwegian cabin crew renumeration is in line with the market rate and in many instances above that of our competitors," a Norwegian Airlines spokesperson said. "We never comment on the personal situation of our colleagues."